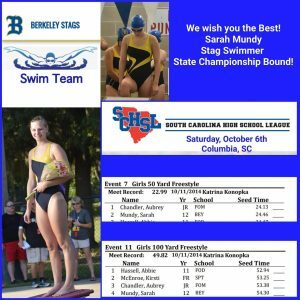 Boys/Girls Varsity Swim · Oct 7 Sarah Mundy has a BIG weekend for Stag Swim! 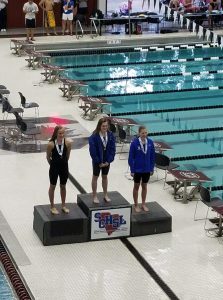 Berkeley High School would like to congratulate Sarah E. Mundy for her 2nd place finish in the 50 yard FreeStyle swim with a 23.85 and a 3rd place finish in the 100 yard FreeStyle with a 52.50. 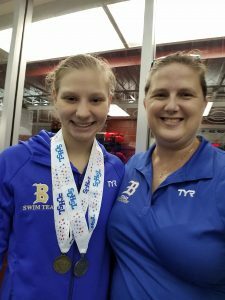 Sarah is a Senior at BHS and has been qualified and attending Winter Junior Nationals and National Swimming Meets, as well as, Summer Junior Nationals Meets. Sarah has also made Scholastic All-American for the last two years. Sarah verbally committed to Colorado State University. 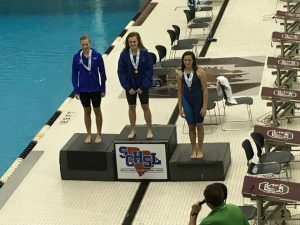 Berkeley High’s Swim team would like to thank Sarah for all of her knowledge, encouragement and dedication to our swim program. We will also like to express many good wishes for her future endeavors. We look forward to seeing great things from you, Miss Mundy!! !